Ahmedabad University, Office Campus, Commerce Six Crossroads, Ahmedabad, India 380009. Historians say storytelling was one of the prime reasons human civilisation advanced! Ever went on an adventure and returned back with a thousand stories?! Wonderful! Let’s hear stories from your biggest adventures! And come and hear about the stories of others AND see what others have been upto! In this give and take of the travel experiences through storytelling, you shall unleash and discover the power of words and stories, make many new friends, learn about their stories, come up with many new ideas for trips, and so much more! Expected story duration: 5 to 10 minutes. We trust that you’ll keep it non abusive. So, what are you waiting for?! Let’s hear your story! For more details, please connect via WhatsApp at Jatin(+91-9871154845) and via e-mail at wandergupt@gmail.com. Wander Gupt is my brain child, an outdoor enthusiast, a BITS Pilani Hyderabad Alumnus. After having traveled extensively for past 5 years, biking nearly 70,000 kms, trekking up solo Mt. Everest Base Camp, etc., I launched Wander Gupt to enable others to have the similar great experiences! Wander Gupt was launched with the idea of taking forward the Experiential Travel. Besides the actual physical travels, books and stories too take us places and offer enriching experiences! 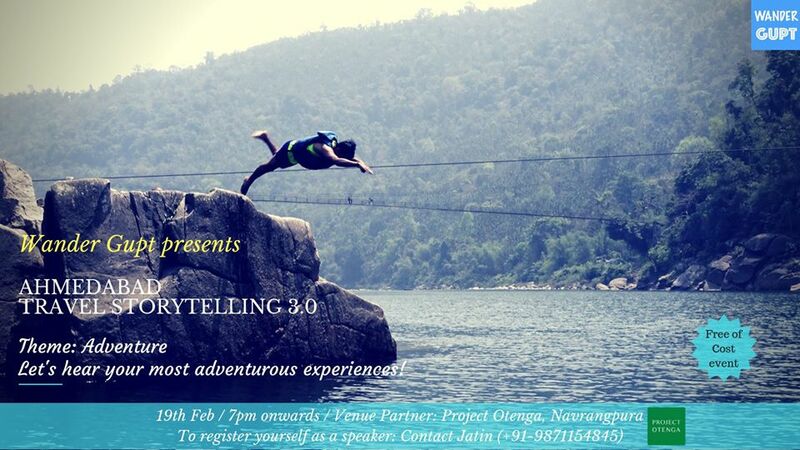 And hence, it made sense for me to introduce this event series as another component of Experiential Travel.